Madison Keys at the 2016 US Open. Last week, the eighth-ranked tennis player in the world found herself in a familiar place doing a very unfamiliar thing. 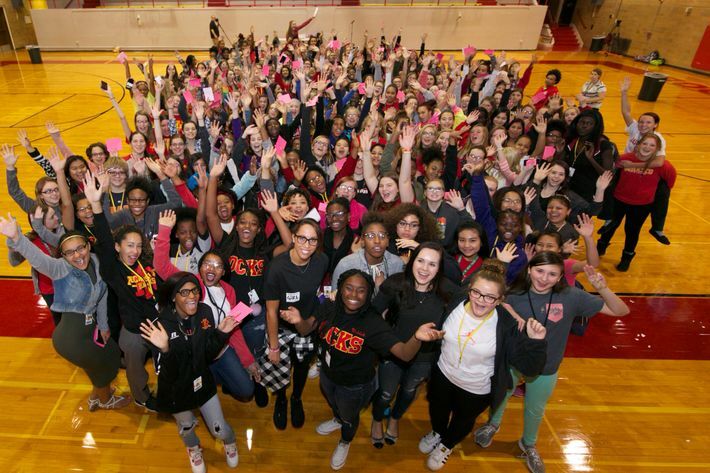 Madison Keys was in the Rock Island, Illinois, high-school gym where she’d watched countless basketball games, but instead of cheering on the Rocks, she was listening to nearly 200 girls discuss the difference between how men and women handle conflict. Dismantling such gendered stereotypes is a very different goal from winning a Grand Slam title, but Keys — the first American woman since Serena Williams in 1999 to be ranked in the top ten — wants to do both, and more. Immediately after the Olympics, the 21-year-old became an ambassador for FearlesslyGIRL, an organization that promotes leadership and empowerment among high-school girls through three-part assemblies called summits, at which girls talk with peers and mentors and, hopefully, develop a sense of confidence and community. The FearlesslyGIRL summit curriculum encourages girls to talk about what’s bothering them and learn to be okay with asking for advice. “That’s something that I struggle with even today,” says Keys, the oldest of three sisters. “‘Ugh, I don’t want to ask for help.’ And it’s like, ‘Why?’ Asking for help doesn’t make you weak or vulnerable or anything like that, it’s just … sometimes you need help.” Perhaps this stigma is rooted in the pressure for girls and women care for others before ourselves while voicing nary a complaint.